How about eating Aamras, Mango Smoothie or Mango Ice Cream even after Mango season? 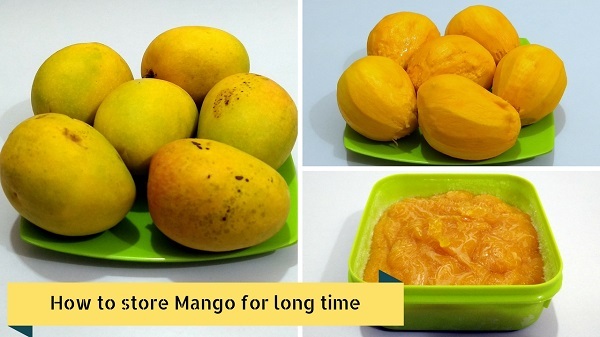 If you crave for mango just like I do, follow this simple method to store Mangoes. Freezing Mango Pulp / Mango Puree is the best way to preserve fresh Mangoes for a long time. Here I am sharing a secret but the simple trick for How to store Mango / Freeze Mangoes for a long time. Select quality Mangoes by Aroma, not by colour. Peel and slice mangoes into small pieces. Add 2 tbsp. Sugar and grind till smooth. The quantity of Sugar varies depending on sourness of Mango. Transfer to small size Air-tight containers. Storing in small containers (approx. 300ml) is advisable. If you store in a large container and consume in small quantities, Mangoes will not stay fresh for a long duration due to temperature variations. Store Mango puree in the freezer. It can be stored and consumed up to 6 months. Enjoy Mango dishes even after Mango season using this Frozen Mangoes.